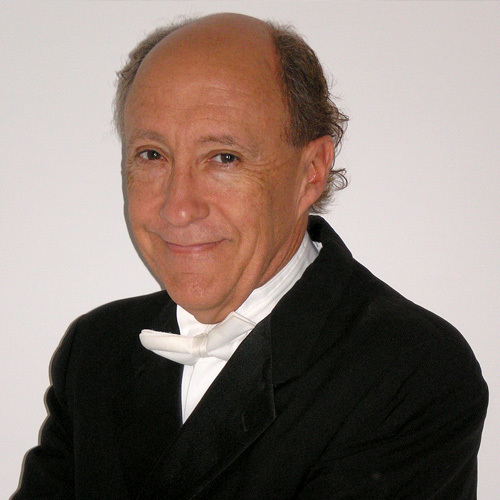 Jorge Pérez-Gómez was born in Mexico City, Mexico and is presently Director of Orchestral Activities and Professor of Conducting at the University of New Mexico. Maestro Pérez-Gómez has appeared with orchestras all over Europe and America. After beginning his conducting career in his native Mexico City as Artistic Director and Principal Conductor of the “Orquesta Mexicana de la Juventud”, Maestro Pérez-Gómez received the Diploma of Merit in conducting from the Accademia Chigiana in Siena, Italy and degrees from the San Francisco Conservatory of Music, Northwestern University, and the Eastman School of Music in the United States. Maestro Pérez-Gómez has been recognized both in the United States and Mexico for his research and recording of the works of Mexican composer Silvestre Revueltas (1899-1940). His recording of “ Troka” and other of the composer’s orchestral works with the Moravian Philharmonic (Czech Republic), gained praise as an important document which demonstrates why Revueltas is considered one of the greatest representatives of Mexican culture and one of Mexico’s most accomplished artists of the 20th century. In October 2004 with the purpose of presenting the “ Historias Revueltas “ (four staged works with puppets) in collaboration with the puppeteer company “ Teatro Tinglado “ from Mexico City, Maestro Pérez-Gómez was invited to take the University of New Mexico Symphony Orchestra on tour to Mexico. The premier performance in Mexico of “ Troka” with puppets, as originally conceived by the composer, was the highlight of these performances. Most recently Maestro Pérez-Gómez been invited as guest lecturer of the music of Revueltas by diverse Italian conservatories ( Rome, Florence, Salerno, Frosinone, Campobasso, Potenza, Avellino). Maestro Pérez-Gómez has conducted the National Orchestra of Mexico (Mexico), the Oradea Philharmonic and Brasov Philharmonic(Romania), the Festival Orchestra“ Musica nas Montanhas,” (Brazil), the Orquesta Sinfonica de la Universidad de Guanajuato (Mexico), the Orchestra Spazio Musica (Italy), the San Jose Symphony Orchestra and the New Mexico Symphony Orchestra ( U.S.A), among others. He has served as faculty of the TusciaOpera Festival in Viterbo (Italy), and of the Spazio Musica Opera Festival in Orvieto (Italy). Dr. Pérez-Gómez offers yearly conducting masterclasses in that country having established an excellent reputation as conducting pedagogue. Most recently the Italian university of Tor Vergata in Rome, invited Maestro Pérez-Gómez to write a conducting handbook of conducting technique for a new masters program in which he will participate as active collaborator.